LeftieBiker wrote: Trying to solve a phantom power drain with a larger battery is, at best, a band-aid approach. At worst it means wasting an expensive battery and still getting stranded. The best band-aid solution is a battery maintainer, used regularly. Make them solve the problem. In the mean time, a small REAL battery tender if you need to. 3 years old, NEVER a battery problem, even when misused. I do charge the battery at least once a week with a Battery Tender, 1.25 amp 3 stage unit. About every other time it tops off in less than 1 hours and then sometimes it takes overnight to top it off. If my wife tells me she saw the battery symbol or I do I top it off as well. I have a battery tender lead under the charge port for easy access and charging. While I agree that ultimately I think there is something wrong with the car, after reading that other thread it seems like there is no conclusive evidence as to what is causing the phantom drain and the lack of charge. My theory now is charging with the larger 6kw on-board charger doesn't give the system enough time to top off the battery. That coupled with the weird intermittent 800 mA load on the 12v battery is the problem. I have toyed with the idea of getting a 12v data logger, but honestly it is less expensive to get a better or more appropriate (deep cycle) battery and just charge it once in a while. My long term hope is Nissan will figure out what is up with their charging parameters and tweak it before I get the next one, or maybe a software update on this car. I have the temp and humidity one and it works great. That current level sounds like a stuck relay. Probably a bad body control module. I ended just replacing with a deep cycle AGM (Optima Yellowtop) mainly because I needed it that weekend and it was what the auto parts store carried. It was a perfect fit (not sure if the model in the link is the exact one, though). I would still spend the extra $20 on a datalogger to get to the root-cause, but even if the phantom load is corrected I think a deep cycle is a good idea. 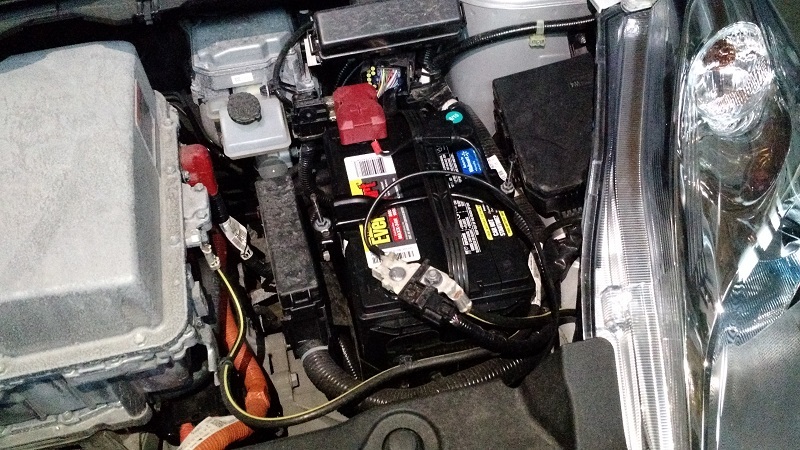 You should never have a problem with the 12v battery under any circumstances given how new the vehicle is. You might have a bad 12v battery, bad DC to DC unit or both. A good Leaf technician will be able to figure it out what the issue is. retired a 2011 Cayenne Red SL, had only 22,000 mi. After having yet another dead battery situation, this time not a home, I decided to swap the 12v battery. Fortunately I have been carrying a 7 ah SLA and just plugged it in parallel with the 12v battery and everything started right up. I know the 11&12's are laid out differently under the hood, not sure what might fit in there. But this worked well for my 13. So now I have a larger battery in there. I know it doesn't fix the issue of something draining it, but at least it should last longer under whatever that load is. Here is a pic of the battery in there. I should have taken a before and after, but here it is. Here's my '13 Leaf with the stock 12 volt. BTW, maybe the negative cable would've fit better if you had a 12 volt where the terminals were closer to the driver's side.